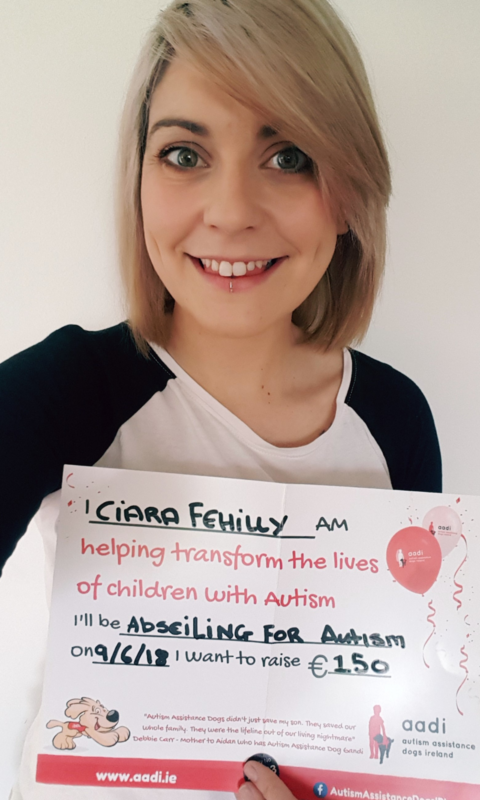 Hey everyone, I will be abseiling off Croke Park on the 9th of June in the hopes to raise some money for Autism assistance dogs Ireland. Dogs are such an amazing gift to a person, they give comfort love and an overall connection and friendship like no other. Autism is a life long disabilty that can cause anxiety, isolataion, loneliness and sensory overload.Assistance dogs provide support for all of these discomforts to a person living with autism.I have a son who is autistic and he is my world. It is a dream of mine for him to recieve his own assistance dog one day. Unfortunatly we have a Long wait ahead, so for now i want to do my very best to help raise funds for another family. Autism assistance dogs ireland give hope to children and hope to their families. Well Done Ciara, your great! !